Miscellaneous. Watercolour heightened with white. Unsigned or dated. In the background, the carrier HMS FURIOUS; in the foreground (extreme left), a ditched aircraft, tail up and probably not going to remain afloat for long; and foreground, right, is the destroyer HMS TYRIAN who has just launched her crash boat which we see in the water abreast the aft funnel as her crew bend on their oars and hasten to close the ditched aircraft. There is no sign of any aircraft crew in the water. 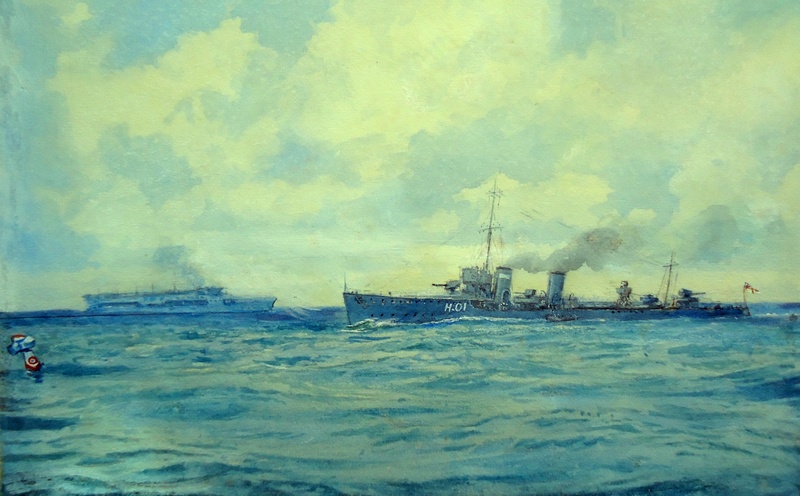 This watercolour by an anonymous hand probably dates from the late 1920s/early 30s.